When it comes to the artisanal coffee movement, much to our delight, Hawaii stands up to bigger cities. Perhaps it’s because it’s the only U.S. state that’s allowed to grow coffee plants commercially, and Kona coffee (from the Kona district of Hawaii Island), sees near-perfect coffee growing conditions. Therefore, Kona coffee is considered one of the best and most expensive coffees in the world and coffee shops across the islands better live up to the hype. 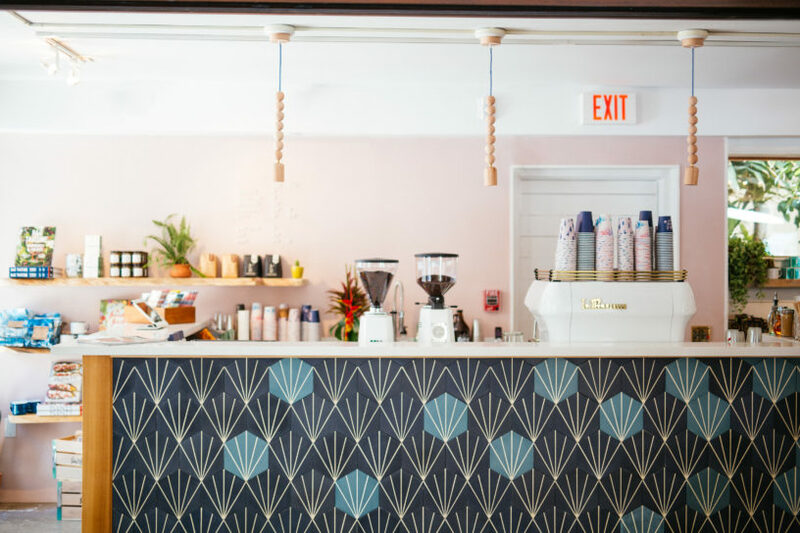 But whether offering coveted Kona coffee or pouring over with Portland-based Stumptown, the independent cafe’s throughout Oahu are catering to a discerning clientele—welcoming Americano addicts, cortado connoisseurs and pot heads alike. Below, a few of our favorite coffee shops on Oahu—places where the passionate people serving up a little love in a cup are as charming as the atmosphere. The Diamond Head neighborhood is full of charm and one place whose cup runneth over is Ars Cafe. Alongside high quality coffee, skilled baristas are also whipping up must-have matcha lattes, scooping homemade gelato and offering good eats like baked goods, specialty sandwiches and toasts, and more. Plus, every first of the month the cafe hosts an art opening for all to be inspired. This Aussie-style cafe at SALT at Our Kakaako is arguably the hottest gathering spot in the Kaka’ako neighborhood. The Arvo crew (husband and wife Dixie and Mason Rose, as well as Dixie’s sister Casey Wiggins) is dishing out picture-perfect avocado toast, matcha pudding, lavender lattes, and, of course, Aussie favorites like Vegemite toast and flat whites. Not to mention, the cafe is housed alongside two of our favorite locally-owned shops: the botanical boutique Paiko and surf shop Milo. When we need a caffeine fix on the North Shore, we stop off at Coffee Gallery in historic Haleiwa town. Not only does this buzzing cafe have great coffee, but the outdoor seating area is a great place to do some work or catch up with friends. Not to mention, the staff is slinging some seriously good eats—think healthful bites like vegan tropical bliss balls, acai bowls and spirulina smoothies, and indulgent island-inspired treats such as lilikoi bars, and the Okinawan sweet potato, macadamia nut and haupia bar. When wandering Waikiki, whether pre-surf or post-shopping, a stop at Kona Coffee Purveyors is a must. The artisan coffees are made using some of the best single-estate Kona coffee beans that are roasted to perfection right here on Oahu. Thanks to a partnership with San Francisco-based pastry kitchen b. Patisserie, alongside its lattes, the staff behind the sleek marble countertops are also dishing out sweet and savory bites. We’re pretty positive that the kouign amann (pronounced “queen ah-mahn”) increases your dopamine levels almost instantly. The cozy cafe tucked back in Manoa Valley is a haven for drip coffee lovers looking for a seriously fresh cup. There’s no pre-made beverages here, so expect to wait for your coffee to be freshly ground and prepared to order—a detail that delivers delicious results. Morning Glass also offers homemade breakfast, lunch and weekend brunch, with rotating specials and bakery items, too. What’s more, this neighborhood hangout looks to Hawaii’s farmers to source local meat and produce whenever possible. Here at the Surfjack, we’re proud to house Olive & Oliver, a seriously style-minded retail store, but it’s the cafe that keeps us, residents and visitors going on early mornings, after surf sessions or long days spent by the pool. The signature art-inspired cups have become quite popular on Instagram, but it’s what’s inside that really counts (isn’t it?). The crew is slingin’ #damngoodcoffee—aka perfect pours of hot or cold brew, matcha lattes, chai teas and more.